ERIEZ DIGITAL STAINLESS STEEL METAL DETECTOR with NEW STAINLESS STEEL THROUGH-CONVEYOR, 8 7/8 inch high by 25 7/8 inch wide usable aperture opening in stainless steel washdown sealed search head enclosure, with integral digital touch-screen operator controls. Overall aperture opening is 10 inch high, but the conveyor bed and belt take up an inch (and 1/8) of the aperture height. 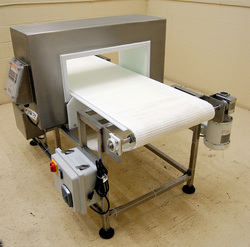 The stainless steel washdown-sealed reconditioned metal detector head is mounted on an all NEW stainless steel washdown belt conveyor, with a new 24 inch wide by 6 foot long interlocking plastic chain type belt, running over a UHMW plastic bed. 33 inch belt working height on 2 inch +/- adjustble feet. This tubular stainless steel frame belt conveyor is complete with a new wash-down gasketed PVC control box with a new 110 volt single phase washdown motor; all integrated with the search head to provide for a belt-stop-alarm reject system. All stainless steel food grade sanitary washdown configuration. 110 volt single phase (standard household current) electrical input, with stainless steel Nema4 power supply box for the detection head. As of this writing, this refurbished metal detector / new through-conveyor combination is IN stock in LIKE NEW condition, fully operational, ready to go and available for immediate shipment. This page contains a single entry by Michael C. Shults, Alard Equipment Corp published on August 28, 2013 2:49 PM. z9540 was the previous entry in this blog. y1900 is the next entry in this blog.